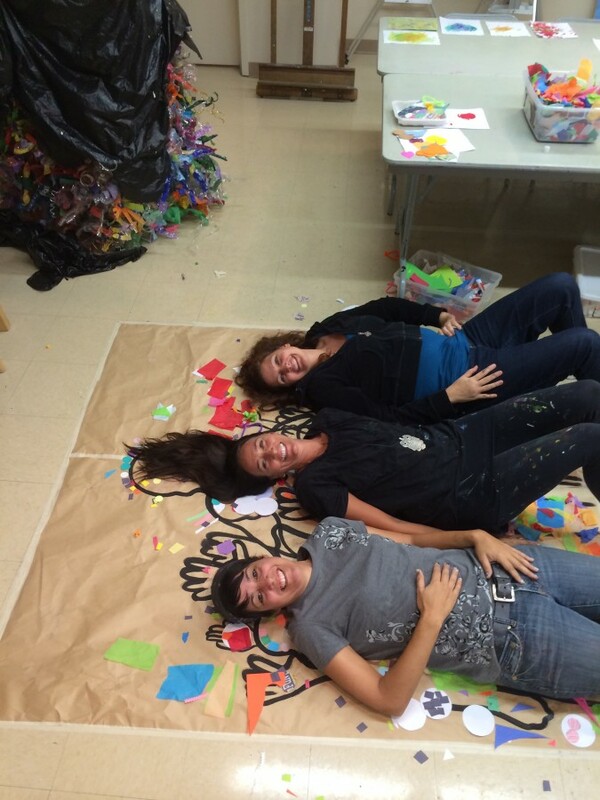 I had the pleasure of working with Julia Andrews, Isabel Perez Salazar, Lori Pratico and Cameron. Together we worked with the children and inspired them to create, here are some examples of the amazing work they did. Categories: Education, Inspirational, Workshops | Tags: Art Education, Artists With Autism, ASD, Autism Spectrum Disorders, Autistic Children, broward county, Bryan w. Knicely, Classrooms, Clay, community, Coral Springs Museum Of Art, creativity, dan marino Foundation, florida, imagination, Isabel Perez Salazar, jacklyn laflamme, Jacksonville Museum Of contemporary Art, Julia Andrews, Lori Pratico, MOCA, Museum Galleries, museums, Outreach Art Classes, painting, Parkside Elementary School, Pilot Programs, Programs, Rainbow Artists, sculpture, Spin Art, Staff, Studios, Visual arts, Workshops | Permalink. Everyone had a blast painting live at “An Artists Encounter” with Around Town Arts & Culture at The Miami Design And Remodeling Show. Thank You to Amy Sherit & Suzanne Okun from Around Town Arts & Culture Magazine. Categories: Events, Paintings, Workshops | Tags: Around Town Arts & Culture, art, Art Basel, Design, Design District, events, florida, Home, image, jacklyn laflamme, Lincoln Road, Live, Magazine, Miami, Miami Beach Convention Center, Miami Beach Florida, networking, painting, Remodeling, Show, South Beach, Timothy Leistner, United States, usa., Workshops | Permalink. I am looking forward to “An Artist Encounter” with Around Town Arts & Culture. 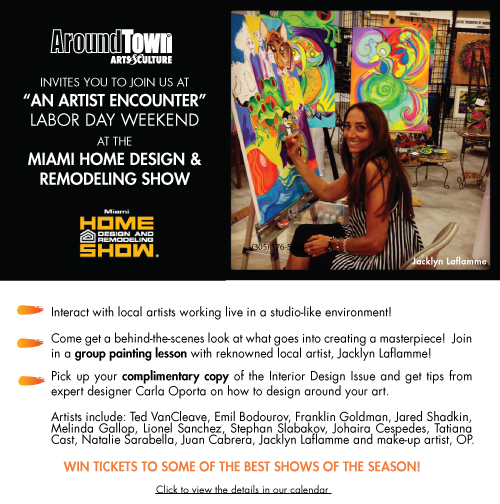 Come on out and paint live with us at the Miami Home Design And Remodeling Show Labor Day Weekend, at the Miami Beach Convention Center. 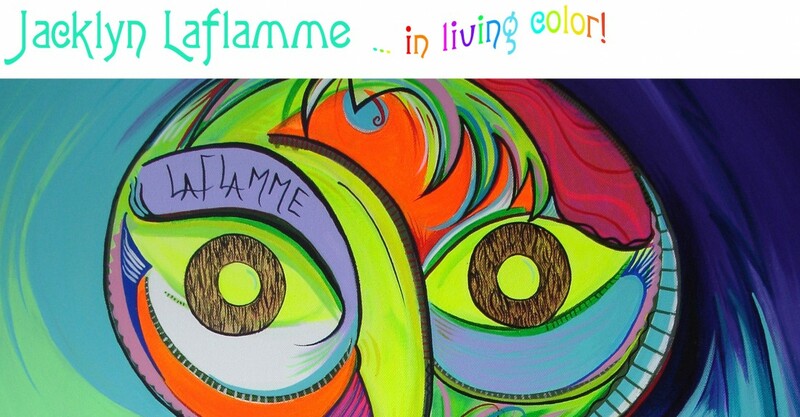 I will be painting live on Saturday, August 31 & Sunday, September 1, 2013 from 12:00 pm- 10:00 pm. Come get a behind the scenes look at what goes into creating a masterpiece, join me in a group painting lesson. Hope to see you there! Categories: Events, Paintings, Workshops | Tags: Around Town Arts & Culture, art, Art Basel, Design, Design District, events, florida, Home, jacklyn laflamme, Lincoln Road, Live, Magazine, Miami, Miami Beach Convention Center, Miami Beach Florida, painting, Remodeling, Show, South Beach, United States | Permalink. 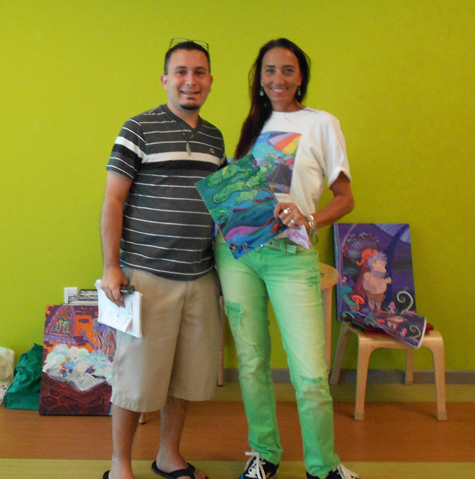 Last week Jacklyn and I participated in an Art & Literature Event with The Fairy Tale Project at Young At Art Children’s Museum in South Florida. Scott Fishman from the Forum Publishing Group interviewed Jacklyn for an article that was to be published in the Ft. Lauderdale Sun Sentinel. It just came out a couple days ago and I wanted to share it. Here’s Scott with Jacklyn surrounded by a couple of the paintings that were used in the Fairy Tale Project’s children’s book series I wrote… which Jacklyn beautifully and imaginatively created the artwork for! Here’s the article “Davie Event A Feast For Art Lovers“. Click on the image for a link. Young At Art – A Day At The Museum and Feeling Froggy! Categories: Books, Events, Paintings, Workshops | Tags: a night at the museum, art, artist, author, broward county, children, childrens books, dani lynn, fairy tale project, fairy tales, fort lauderdale, forum publishing group, Frog, jacklyn laflamme, literacy, Literature, museum, scott fishman, sun sentinel, young at art | Permalink. “Mainstreaming Engagement” The Arts As A Powerful Force In Building Better Communities with Doug Borwick, was a very powerful workshop that I attended. 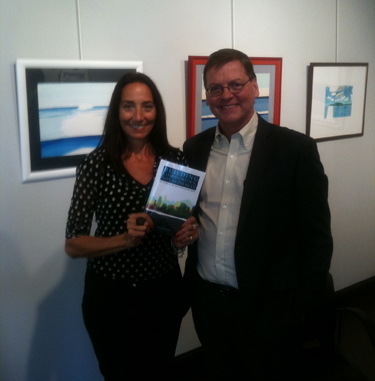 Dr. Borwick is a leading advocate for community engagement in the arts. He is the author of Engaging Matters, a blog for ArtsJournal and the author/ editor of Building Communities , Not Audiences: The Future of Arts in the U.S. The class offered by The Broward Cultural Division, was very informative. It was inspiring to hear about the shift in the art world and how we can all make a difference within our communities. The workshop provided wonderful information about new ways to approach how we can work as artists and the steps we need to take to make that change. Success will not necessarily come to you, you must take action and go for it. We all have the power to be the master of our own success but we have to do the work. In this particular case, attending an amazing workshop and further educating myself in the arts is a great opportunity to feel inspired, network and give me ideas to ponder. BUT it is not enough… it is important to remember that you need to take all that information, understand the principles and put them into practice. Choose a path that is right for you, stay focused and do the work! Thank You to the Broward Cultural Division for all the amazing workshops and all that you do to support the Arts and a very special thank you to Dr. Doug Borwick for taking the time to meet with me after the class one on one. The information you provided will be invaluable as I continue down my chosen path. Categories: Books, Inspirational, Workshops | Tags: acrylic, art, Art exhibition, art gallery, artist, artsjournal, broward county, broward cultural division, building communities, community project, doug borwick, engaging matters, florida, fort lauderdale, jacklyn laflamme, not audiences, organization, painting, success, the future of arts in the u.s., visual art, workshop | Permalink.